Week two of school is in the records and we are adapting to the new type of schedule. 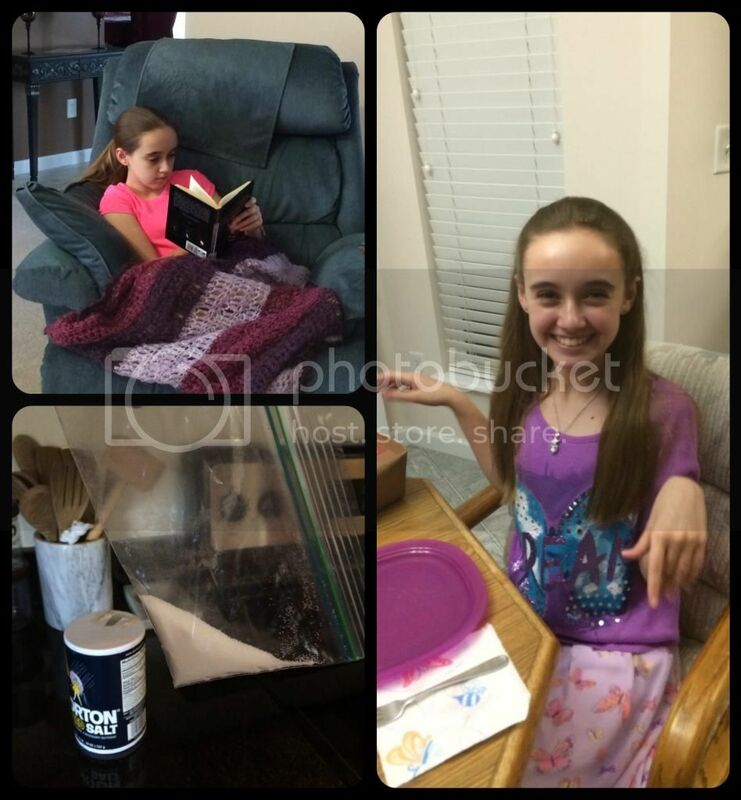 I've been working hard to take cues from Amber as to how much school and other activities she can handle each day. We weren't always able to stick to my plan for the day, but we are accomplishing documentable school hours, Amber is learning, and we are adjusting to life with her chronic illness. Amber finally had her first German lessons this week and she is in thrall with it similarly to when she started Latin. I'll see how long this lasts. She does enjoy languages though and has declared that she wants to learn as many languages as she can. Maybe that will be her calling in the future. We've started math back up too, leaving only science and co-op which both start in September. So far we are enjoying the guidance provided in Tapestry of Grace for history. While we are still mostly using the plans I created for history and literature, we have found the accountability questions for Amber and discussion summary for me to be some of the best we've used. It isn't simply checking Amber's knowledge of the facts, but teaching her to think about why events played out as they did and to help learn from history - which is why we study it. We started up literature this week and will be studying Beowulf for at least the first quarter of the school year. Our study began by reading an easier version of Beowulf so that Amber could get the plot and a few details down before we tackle a version with more difficult language. She found the story tantalizing yet gruesome. I also plan to let her watch the 2007 movie version of Beowulf as an alternate sick day lesson in the near future. We did put a couple of alternate sick day lesson plans into action this week too. Amber had a rough time after some errands when her heart rate was high and blood pressure was quite low. I let her stand for too long while we were out, then she became overly warm on a not insubstantial walk from the parking area to our lunch location. It was my fault. After returning home we opted to utilize a historical fiction book on Charlemagne and some history videos for the rest of school that day. Right now, since this is still junior high and we aren't worried about credits yet, our school time just needs to meet hour totals for core and non core subjects. We don't need specific hours devoted to each individual subject. Ideally, we will cover everything planned in each subject, but worst case we will at least make our required hours by utilizing our sick day plans. We did FINALLY have the second part of our Roman Day on Wednesday. 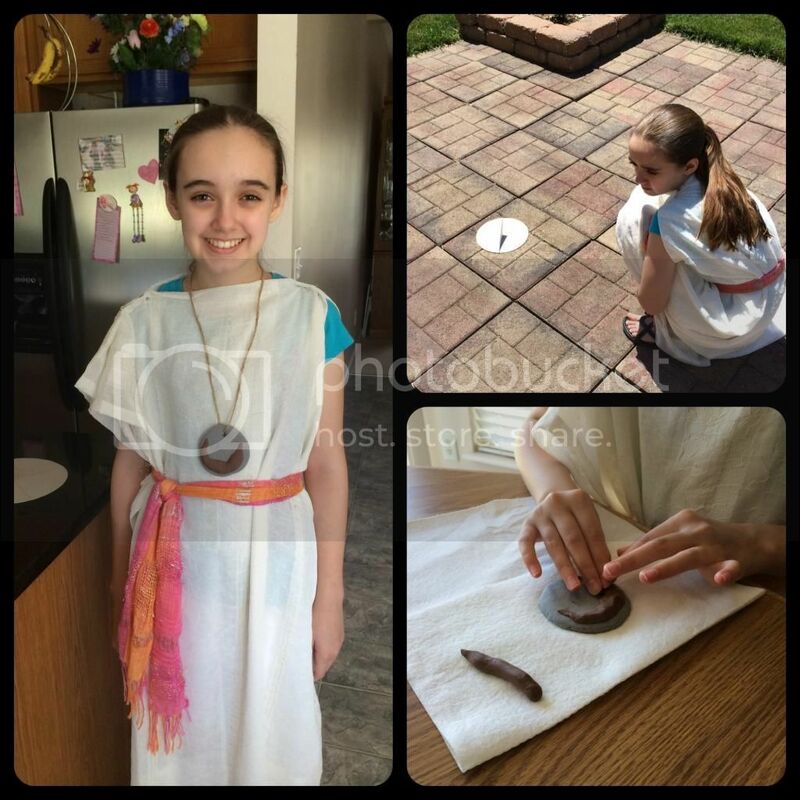 We had an impromptu Roman Day in May, right at the end of sixth grade, which incorporated only about half of the ideas we planned. Since the first one was quickly organized, we did not have supplies or time for all our projects. This week, as we finished studying the fall of the Roman Empire, we were able to enjoy our second Roman Day. Amber and I each made a bulla (medallion). We crafted a sundial and tested it out - it may or may not work as there was some confusion with the instructions. 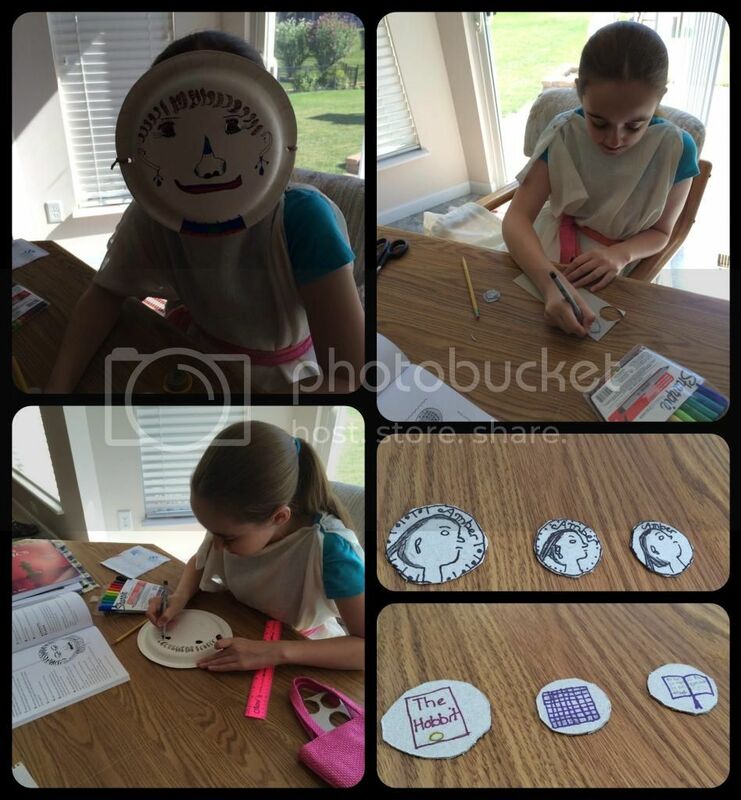 Amber made Roman-like coins with her own face and name, and finally made a pantomime mask. In addiction to the crafts we read about the daily life of a senator's family. 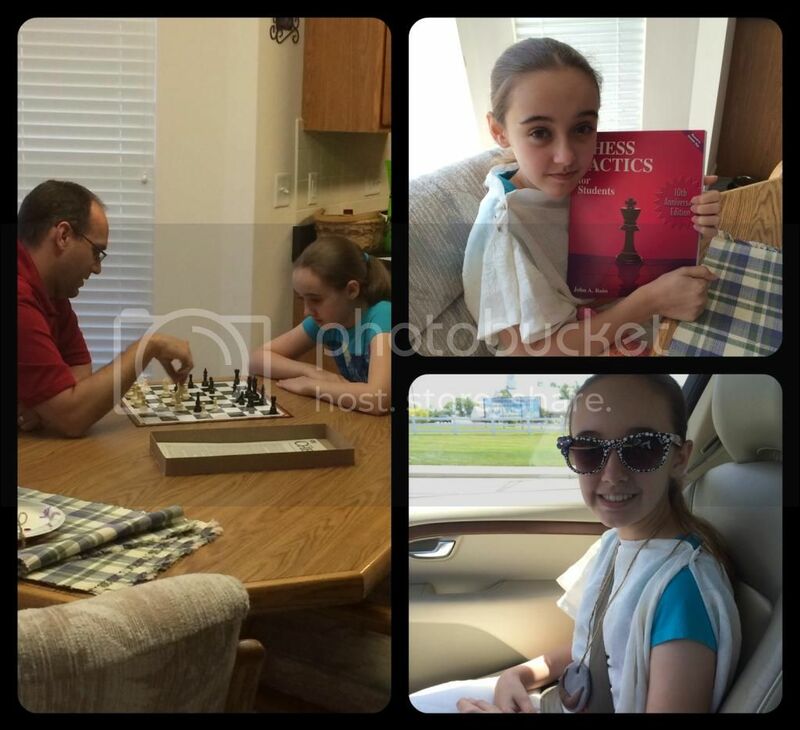 Amber's book for co-op chess class came Wednesday and served to fuel her excitement that day. Fred kindly agreed to play chess with Amber that evening and let me have some much needed alone time that I didn't know I needed until it happened. (RIGHT-TOP) "MY Chess Book... MINE"
Medically, we have had some more information and changes this week. We received from the neuroscience office details about some of Amber's upcoming tests and helpful recommendations to make life smoother. Amber has also been able to begin her treatment regime, which is for symptom reduction only. She intakes 3 teaspoons of table salt above what she was ingesting normally each day as well as at least 2 liters of water. This is to increase her blood volume and help with the low blood pressure events. We also have a detailed supine exercise plan to follow. Thankfully, we already own a recumbent exercise bike so Amber can exercise without going to the gym everyday. Amber has started wearing her compression socks at home and it makes her feel a little better by encouraging better blood return. We are still waiting for the abdominal binder, which should help Amber stand for longer periods. We also ordered a cooling vest for Amber to use when she wants to play outside or in warm areas. Her body is not regulating its temperature well or sweating properly, so we need to help that along. We also ordered a cute Thirty-One thermal bag and 2 adorable ice packs to use as our daily coolness kit for when we are out and about. We can pop the ice packs with bottles of water into the bag on our way out the door for use if Amber begins to overheat while on errands. This was another great idea from the physician's assistant at neuroscience and we put it into practice today! Amber also had a checkup with the allergist who stopped Amber's allergy shots for now. Sigh. Amber has had not even the smallest site reaction since beginning shots, but the allergist wants to discuss it all with the neuroscience doctor. It's understandable, but frustrating. There is a possibility that an epi-pen may not have the desired results were Amber to have an anaphylactic reaction to one of her shot dosages. As Amber's autonomic nervous system is malfunctioning there is some legitimate concern that she will not react to the shots or epi-pen in a predictable manner. So the shots are off until the allergist has enough information to deem them safe. It's possible there may not ever be enough info to consider the shots safe, and in that case the shots will not resume at all. Today we spent the day with my mom on what would have been my dad's 73rd birthday. After a trip to "visit Dad" we had lunch and then took my mother car shopping. 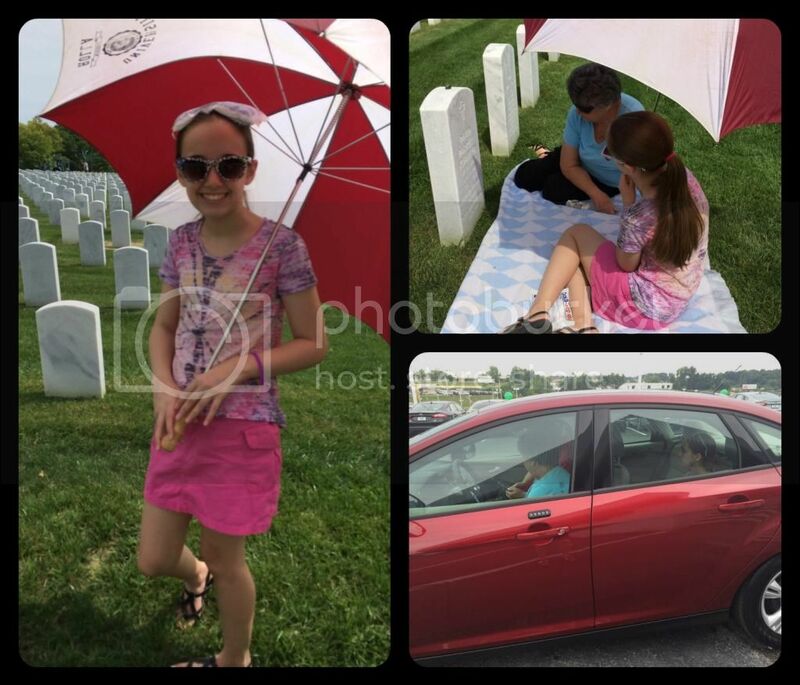 Mom successfully selected a new car and traded in her 13 year old car that Dad had picked out for her right before a four month round of surgeries and hospital stays in 2001. It was a long and eventful day, but it was a good way to spend this day. We were also able to keep Amber cool most of the day through use of sun shades, ice packs, personal fans, and lots of water. She only had one minor incident while we were out today, and is tired this evening but not sick. (RIGHT-TOP) Both staying shaded while talking to Dad. We have another mostly calm weekend coming up and I hope to get a lot of baking completed with food stored in the freezer for quicker week night meals. The coming week will be a busy one, so I need to be more prepared for dinners than normal. It sounds like it was a good week overall. The Roman day sounds wonderful! I am glad you all found an answer to helping Amber and it is going so well. Amber looks happy with her new school schedule. You guys have so much to deal with and consider just to go out somewhere. I thought making sure we had our diastat and extra clothes was a lot! I'm sure most people do not understand the magnitude of how Amber's illness affects her and the importance of being very diligent in her treatments, diet, ect. I'm glad you were able to spend your dad's birthday with your mom. It looks like Amber is doing well with her school and that you're finding ways to adapt to her needs wonderfully!